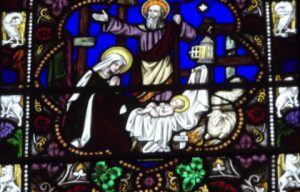 The Nativity is depicted in two windows in St Swithun’s church. You can find this roundel within the third clerestory window, high up on the south, or right hand side of the church. 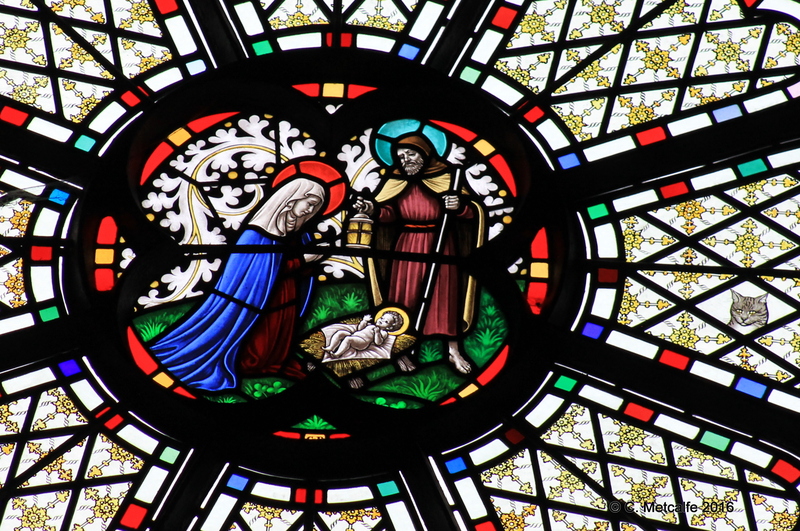 The figure of Mary has a red halo, in contrast to her blue cloak. The figure of Joseph has a light blue, almost turqouise halo, in contrast to his yellow cloak and maroon-coloured gown. Joseph has bare feet and carries a lantern. 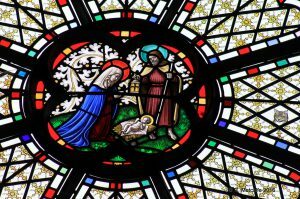 The figure of the Baby Jesus looks up at his Mother, who gazes down at him. The manger is surronded by luxurious foliage. In the surrounding decorated panes, there is the picture of the head of a cat, no doubt the pet cat of the donor. The other image of the Nativity is in the east window of the Chapel of the Nativity (to the left of the main altar). Joseph’s right arm is outstretched and he holds a staff in his left hand. A lantern hangs from a nail and a bright star can be seen against the blue background. Mother and Child gaze at each other, yet we are included because their faces are shown turned a little towards us. There are two sheep lying near the manger. The surrounding pattern is detailed, colourful and very beautiful.